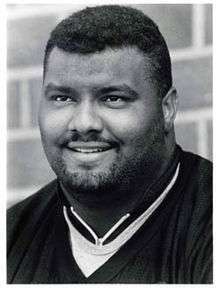 Chester McGlockton (September 16, 1969 – November 30, 2011) was an American football defensive tackle who played for four different teams in his twelve season National Football League career from 1992 to 2003. McGlockton was a High School All-American as a Tight End/Defensive Lineman at Whiteville High School in Whiteville, North Carolina. He played Varsity Football all four years. During his senior year he led the Whiteville Wolfpack to a 15-0 record, a State Championship, and a USA Today National Ranking. He played college football at Clemson University under Danny Ford and Ken Hatfield. He scored a touchdown as a freshman in the 1989 Gator Bowl vs. the West Virginia Mountaineers. McGlockton was drafted by the Los Angeles Raiders in the 1st round (16th overall) of the 1992 NFL Draft. He played six seasons with the Raiders, earning all four of his Pro Bowl appearances with them. McGlockton also played for the Kansas City Chiefs, the Denver Broncos, and ended his career by playing one season with the New York Jets. McGlockton finished his NFL career with 51 sacks including a career season high of 9.5 in 1994. At the start of 2009, he was an intern coach with the University of Tennessee football team. He accepted a defensive assistant position at Stanford in 2010 and worked on David Shaw's staff. McGlockton died of the consequences of left ventricular hypertrophy on November 30, 2011. ↑ "Chester McGlockton Stats". ESPN. ESPN Internet Ventures. Retrieved 8 July 2014. ↑ "McGlockton joins Stanford staff". The News Reporter. Retrieved December 14, 2010. ↑ "Autopsy shows ex-Raiders DT McGlockton died of enlarged heart". NFL.com.